St. Pancras International | An exemplar transport hub. I visit London quite a lot, probably once or twice a week. I head down there from the relatively new East Midlands Parkway station, south of Nottingham, to St. Pancras International. No matter how many times I do it, I find arriving in London is always an event in itself. I actually think St. Pancras is possibly the best way to arrive in London on land. 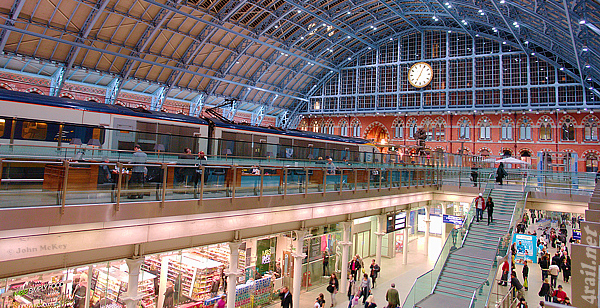 Originally built and opened in 1868 St. Pancras Station has always been the southern terminus for the midlands railway line. Designed by William Henry Barlow, the station had to span the Regents Canal and, because of gradient constraints with the railway line, the trains came into the station between 4-5m above Ground level. Instead of infilling the land, a vast collection of brick arched cellars were formed underneath the station. These were used to store Beer from Burton-on-Trent. The single span roof structure, required because of the cellars, stretches to just under 75m across. The structure itself is a wrought iron lattice. The station has suffered some low points; it suffered severe bombing during the Second World War and faced near ruin and demolition in the 1960’s. However during the mid-2000’s the station underwent a major transformation which was estimated to cost £310m. The reported final cost was £800! Today St. Pancras International is the main London train terminus for East Midlands trains heading up to Nottingham and Sheffield. It also has local platforms for London regional trains and also the southern HS1 line. Finally, it’s the London terminus for the Eurostar, providing rail services direct to Paris, Brussels and many other European destinations. The trains still arrive at the original level (above ground), but the midland mainline platforms have now been setback under a new canopy, which links in to the original structure. The old beer cellars have been exposed and turned into an open retail concourse. It’s like many you’d see at a major airport, but benefits significantly from not being completely artificially lit and ventilated. Most of the shops and cafes sit in the original brick arched cellars. Beyond the successful fusion of historic brick and iron structure, with contemporary glass and steel, I think the best and most successful thing about St. Pancras is the fantastic atmosphere it has. I’m talking specifically about the humanistic experience. The shops have been carefully selected to provide a broad range of essential travel retailers with luxury and aspirational retailers too. Also there are very few ‘high street’ brands here. There are some, but there is an impressive range of Independent retailers, cafes and restaurants too. This is refreshing. But the thing that perhaps impresses me the most, and almost always makes me smile no matter what sort of a day I’m anticipating or have had, is that there are two Piano’s in the main concourse. These are separate, but sit right in the main concourse thoroughfare. They are tatty looking, perhaps intentionally, but simply say on them “Play me, I’m Yours”. And people do. People of all ages and backgrounds, often with a suitcase parked beside them, lose themselves for a short while and play some truly fantastic music. This gives St. Pancras life and character; something I believe truly successful buildings should have, beyond the fabric and function. People are encouraged to use this busy transport hub in many different ways. If you’re looking for a drink don’t go to the Searcy’s Champagne Bar, head to the St. Pancras hotel bar – I think its much nicer. Its in the original ticket hall and many of the original architectural features are retained. You also get a traditional metal (with glass bottom) tankard when you have a pint. St. Pancras is a great building. Its Architecture, both old and new, works well and I believe it provides an exemplar international transport hub. But what also works so fantastically well at St. Pancras is the way people are able to use it and experience it – beyond getting from A to B which is the only reason anyone is really there. It is a destination in itself and I building I love. My firm, Lewis and Hickey Architects, have launched a new website today marking a new milestone in our extensive history. We were originally founded in the City of London back in 1894 as W.A. Lewis. Our first commission from retailer M&S came in 1922 (and we’ve been working them ever since!). In 1930 Patrick Hickey joined the company and then in 1946 we became Lewis and Hickey. For many years we were a southern based practice, operating out of offices in central London and Guildford. In the 1990’s we merged with an existing practice in Edinburgh to form our Scottish office and formed our Prague office in Central Europe. We also had a Dublin office for a period of time, but this was later closed. In the 2000’s we established our offices in Nottingham, Manchester (via acquisition) and also Mumbai office in India. Today we are ranked the “33rd Biggest practice in Britain” by the Architects Journal under their annual ‘AJ100’ rankings. Our new website design is based around a central large image pane which illustrates the practices work in a wide range of sectors. The site has a clean, uncluttered and fresh aesthetic, with simple and intuitive navigation. The site is also ‘responsive’ so the format and navigation of the website changes automatically to suit the viewing device, such as tablets and smartphones. I firmly believe that our new website is a positive step forward for us. It contains a lot of new content in terms of clients and projects. I believe it also conveys a much more contemporary impression of both our work and our business. The website will become an intrinsic part of our on-going media marketing now, especially through Twitter and LinkedIn. The website aims to promote all aspects of our business, including our excellent geographical coverage, both in the UK and abroad from our seven offices. Paul Miele, our Group Chief Executive has said; “This is another milestone for our business. Whilst we enjoy a superb heritage, our focus is very much on looking forward and we firmly believe that the website encapsulates this. We are a very diverse business and the new website will really reinforce this message, which we trust will allow us to expand work in new sectors, to further compliment sectors where we already have a strong profile”. The website has been a personal project of mine. When I joined the Board of Directors just over a year ago, I decided that I would initiate and drive this project. Some great people have been instrumental in managing and contributing to this project, you know who you are, and I’m extremely grateful for your involvement. A special mention must go to our Web Developers; the team at Black Apricot Creative. This is a young company, founded by a talented group of guys, who are passionate about what they do and pay attention to detail; both of these attributes are ones I appreciate and work by myself. So, please go and have a little look at our shiny new website. I hope you enjoy it. Please keep re-visiting it as well because we’ll be updating it regularly with news and projects from around our business. I love tall buildings, particularly getting up them to get an aerial perspective on their surroundings. Over the years I’ve visited the Eiffel Tower, Paris, CN tower in Toronto, Canada, The Rialto tower in Melbourne, Australia, one in Tokyo which I can’t recall the name of (! ), The Gherkin and BT tower in London, and last year; The Burj Kalifa, Dubai. 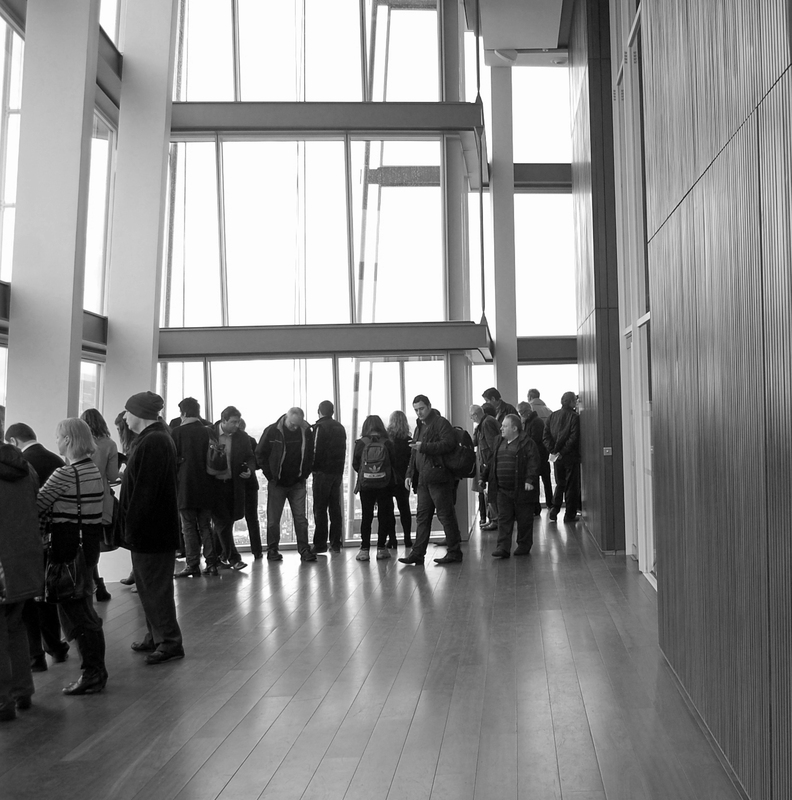 Today I joined the first public visitors in the world to enjoy The view from the Shard. I’ve blogged about the ‘Shard and the uprise of the vertical city’ previously, click here to see it. Image above | The external open-air viewing deck. Construction began on the Shard in March 2009, with the envelope of the building complete for its inauguration in July 2012 – that is a phenomenally quick build for such a large building. It is 309.6 metres (1,016 ft) high, and is the tallest building in the European Union. The tower is 90 storeys high, but has 72 habitable floors. The viewing gallery is on the 72nd floor, at a height of 245 metres (804 ft). The project was conceived by Irvine Sellar in 2000 and the architect was the Italian Renzo Piano. Piano’s concept was born out of the idea of an ice-berg like sculpture emerging from the Thames. Ironically English Heritage, who were strongly opposed to the building, branded it “a shard of glass through the heart of historic London” – and that is where the name ‘The Shard’ came from. 54,488 m2 (586,504 sq ft) of prime Office space on floors 2-28. 758 m2 (8,159 sq ft) Observatory on floors 68-72. 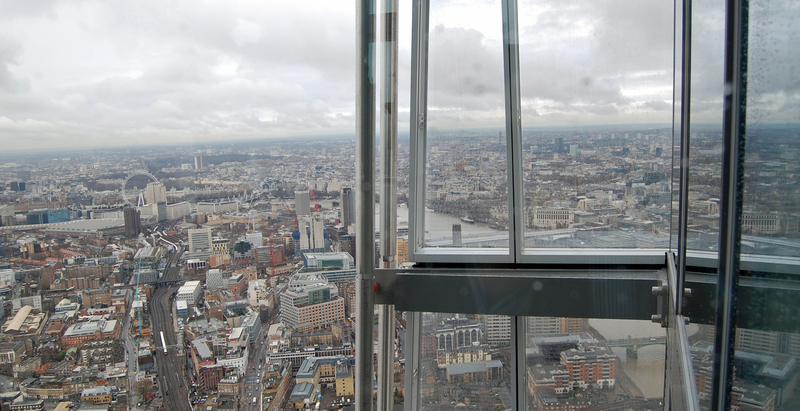 You can see an interactive view from the top of the shard by clicking here. You can also see how The Shard compares to other buildings in London, The UK, Europe and the World at this Guardian feature here. In reality, whilst the Shard appears to be huge in the context of London, it doesn’t really rank that highly in global terms. That said the Shard has already become another globally recognised architectural icon for London, along with Westminster, Buckingham Palace, The London Eye etc. So what of the view/ experience? Is it worth it?…. Image above | The City of London – through the rain! On entering at ground level I had a brief encounter with Boris Johnson and Irvine Sellar who had just opened the observation decks to the public. As the building tapers to its peak, the internal circulation cores reduce also. This meant a two-stage lift ride (slightly odd). When you get to the top you enter into an open space which spans three storeys in height and, as you would expect, there are full-height glass walls. At the corners of the building there are projecting fins on the façade. This makes viewing out more interesting in my view as you have a close reference point against the long-distance views. Image above | the internal viewing deck. Thanks to the British rain, taking pictures proved challenging due to the water droplets all over the glass. When asked to fill in a feedback form on the way down, one visitor said “you need to install windscreen wipers!” Most people seemed unaware at first that there are actually two viewing levels. The top one is open-air! This is fantastic to be able to sense the atmospheric conditions at that height. Surprisingly it didn’t feel windy and you couldn’t hear the wind either. The views out are stunning – even on a rainy day! I think it’s a good height to be at, certainly by comparison to the Burj Kalifa where you almost feel like you’re flying because you’re so high. From the Shard you can see so much detail of London’s rich urban fabric and the constant movement of traffic; vehicles, trains, planes, people etc. You get such a strong sense of London’s architectural diversity as well, the constant fusion of historic and contemporary buildings. 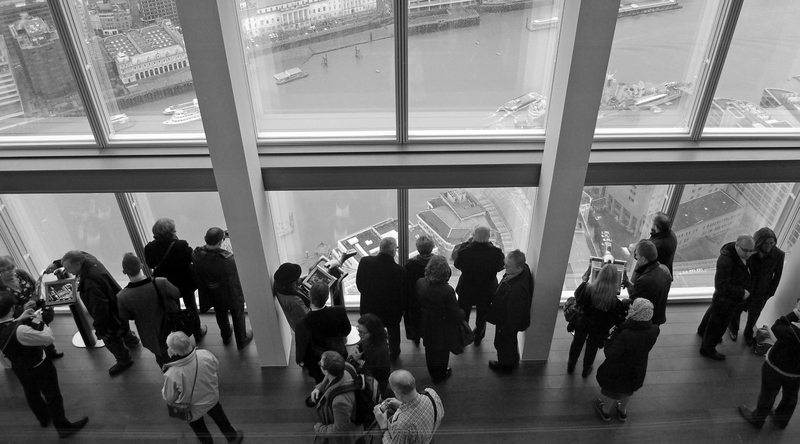 Image above | The view from (and of) the Shard – The Projecting fins. One of the best things about the Shard is that the views outward are uninterrupted. When you look at the tall buildings of the City, they all look so close together, especially with the Helter-Skelter, Cheesegrater and Walkie-talkie, all being built around Heron tower, Tower 42 and The Gherkin. The view from the Shard was, as I expected, a great experience. And one I would certainly do again in the future. There is something really quite mesmerising about watching the world exist when looking down from a height, especially where you can see such detail. 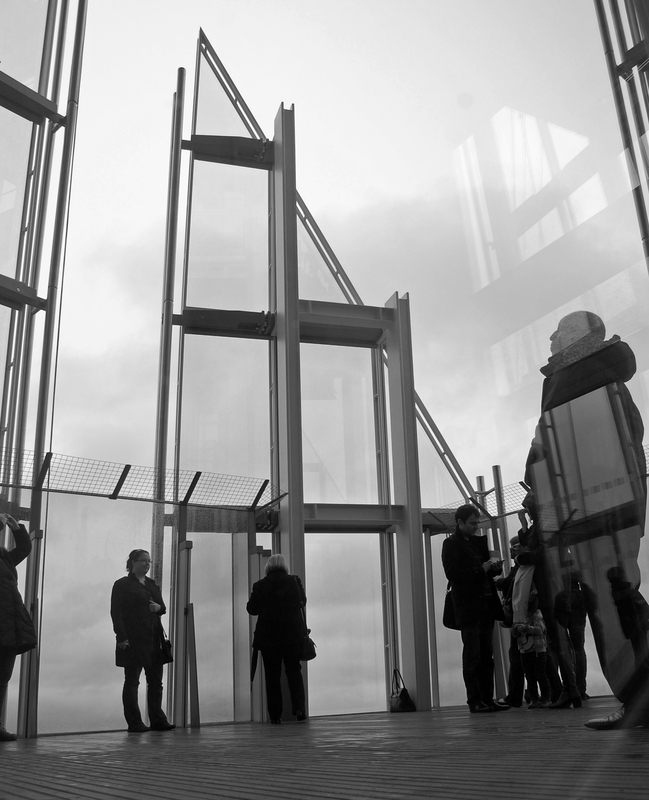 If you’re in London and wondering whether to have a visit to the top of the Shard; do it. You won’t be disappointed.